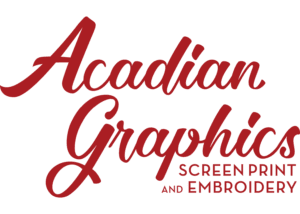 If you are looking for screen printing,embroidery, or vinyl please visit our sister company Acadian Graphics. From corporate events to school organizations to fundraisers, screen printed garments are an excellent way to stand out from the crowd! Offering a larger array of printable colors on the garment of your choosing, we’ll make sure that your designs look as good in print as they do on your display! Have an idea in mind? Get a Quote today! Want to add some extra polish to your uniforms? Or perhaps you’re just considering some personalized items that for an upcoming wedding or a little one that just joined the family. Either way, we can provide top-end embroidery services to suit your specific needs! Looking to make a limited run of personalized shirts or one-off orders? Consider our vinyl services that offer the ability to heat press one-color designs onto the garment of your choosing! As an added bonus, from time to time we do offer even further personalization like rhinestones & more, so be sure to enquire for its availability if you’re looking for added flair!